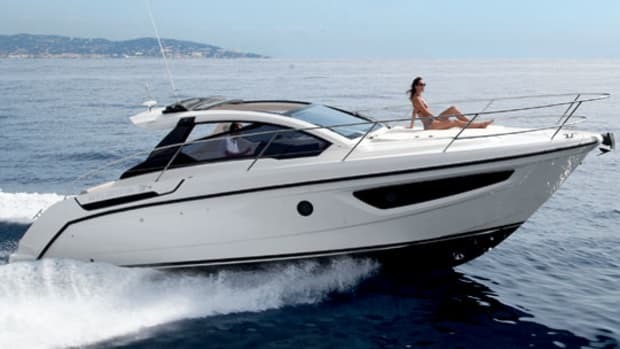 Things have become a lot more competitive in Piacenza, Italy, since the Azimut-Benetti Group took over the family-run Gobbi shipyard a couple of years ago. 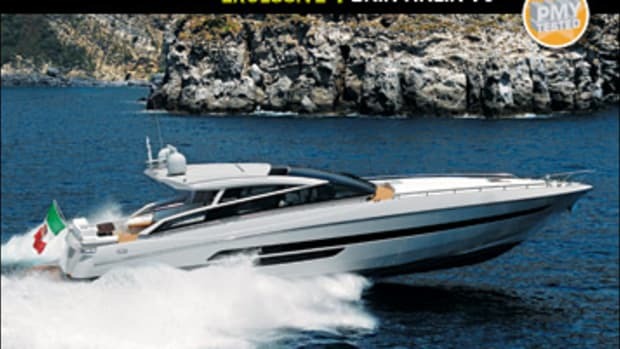 Not that they weren&apos;t already in pretty good shape: Azimut always said that in addition to Gobbi&apos;s sports cruiser know-how, one of the yard&apos;s main attractions was its professionalism. 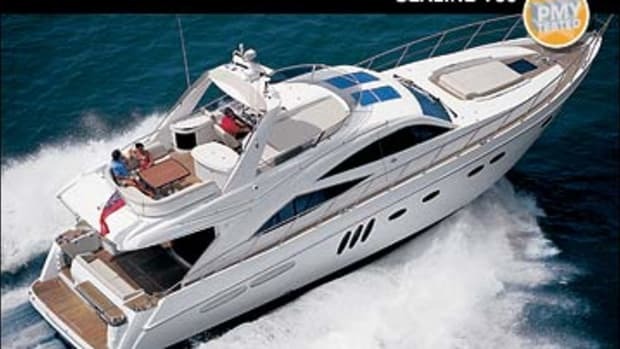 It&apos;s just that while Gobbi was content to be successful in the Italian domestic market, Azimut-Benetti has wider horizons. 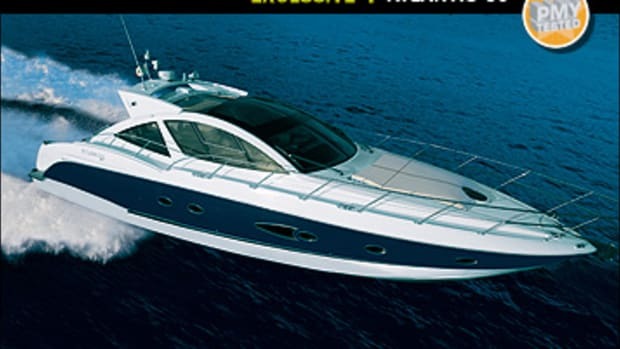 And its ambitions for Gobbi&apos;s Atlantis brand now include a marina near you. 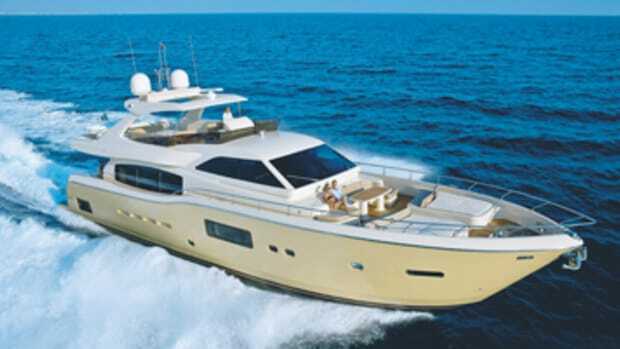 The Atlantis 39 is described as a "world boat," and the world in this instance means the huge U.S. market. Relatively few Italian boatbuilders have made successful inroads stateside, but if Gobbi&apos;s president Carla Demaria has her way, Atlantis will definitely be one of them. 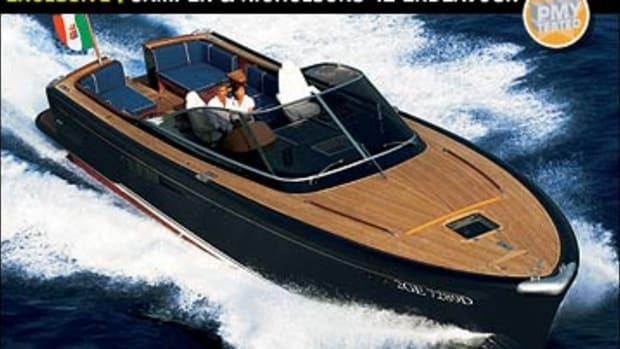 Recognizing that U.S. consumers seem rather more conservative about boats than they are about handbags, shoes, or motorcycles, she engaged none other than Michael Peters—the Sarasota, Florida-based naval architect with everything in his portfolio from superyachts and race boats to the current range of retro Chris-Crafts—to draw the hull and external styling of the 39. This was a smart move on Gobbi&apos;s part. Peters has skillfully created a European look, with just enough Italian flair to avoid frightening the horses (that&apos;s you): a bold, curved windshield that seems to flow through the base of the radar arch; a long, powerful bow; a height-disguising blue stripe to the topsides; rakish, sloping guardrails; and muscular, molded haunches in the aft quarters. Peters also knows a thing or two about hulls. 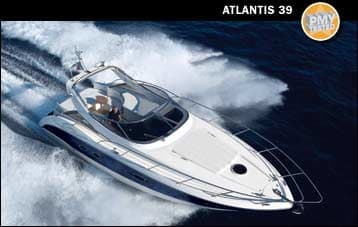 The Atlantis 39 has a beamy, modified-V form, with a deadrise of 22 degrees amidships that flattens out to 16 degrees aft, which proved to be an excellent match for our test boat&apos;s 310-hp Volvo Penta D6s. 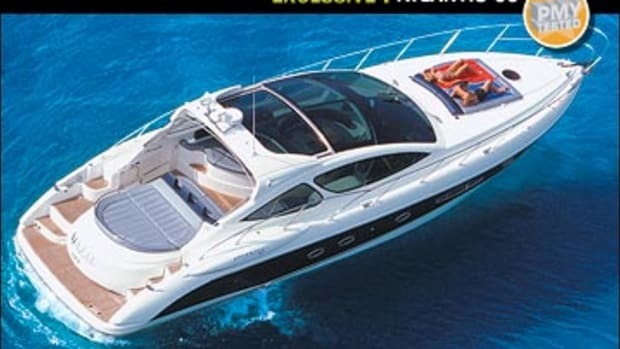 In the directionless, lumpy sea that can develop off Cannes, France, at boat show time when dozens of vessels are out on sea trials, our hull refused to slam in spite of my best efforts and turned on the proverbial dime. An intermittent electrical fault with an engine-stop solenoid prevented us from doing our customary acceleration trials, but she certainly felt like a nippy little performer, leaping out of the hole and onto plane with enthusiasm and topping out at maximum revs within a whisker of 35 knots (40 mph). There was no discernible hump speed: She seemed as happy at 10 knots as she did at 15 or 20 as long as the drives were trimmed in and seemed capable of making comfortable long-distance passages (depending on conditions) at pretty much any cruising speed between about 18 and 32 knots (about 21 and 37 mph, respectively). 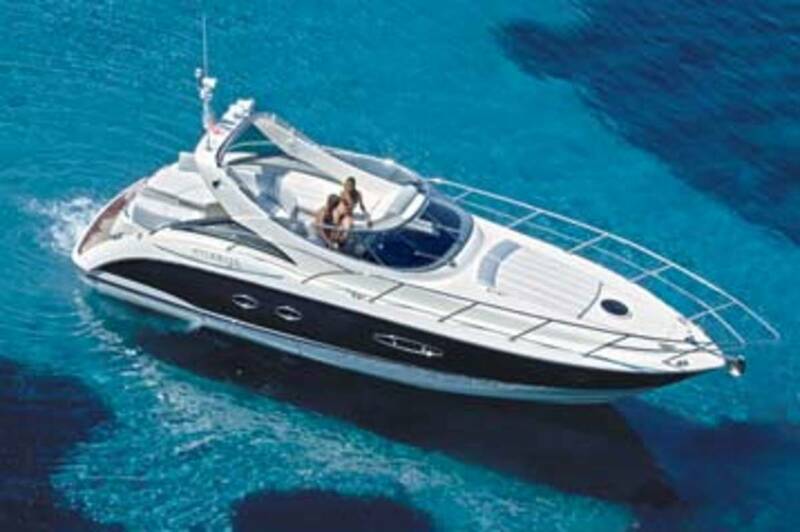 The helm position is comfortable, logically laid out, and, along with the sunbed on the port side, sheltered from the elements by that big windshield. On the aft deck there&apos;s a folding table pretty much surrounded by a circular sofa, which has removable backrests—they&apos;re actually a little too removable and could do with longer pegs to hold them in place—to open up the space for more sunbathers. This whole deck section lifts on two large electro-hydraulic rams to reveal a tidy and relatively spacious engine compartment. Access is excellent. Meanwhile, across on the starboard side of the cockpit is a small drink cabinet with a sink and a refrigerator. 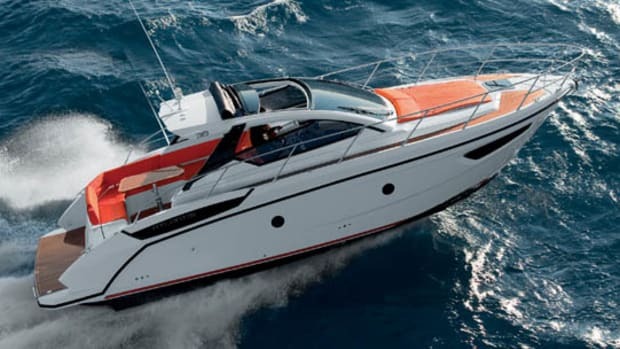 For the below-decks accommodation, Demaria kept the faith with the bold new look pioneered by Carlo Galeazzi for the 39&apos;s big sister, the radical Atlantis 55. Euro-lite external styling doesn&apos;t prepare you for life down below. It&apos;s fun and exciting: A basic palette of pale oak, cream, and ivory might seem fairly safe, but have a look at those red lacquer highlights, the dark mahogany blinds, and the checked rope and red leather upholstery. You couldn&apos;t ask for more of a contrast, yet it all works well together. 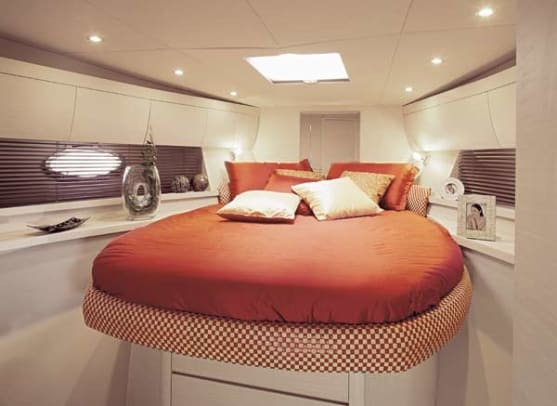 And the flair of this interior is not just confined to the decor: The berths in the aft cabin might be on the short side (just six feet), but the way they slide together to create a good-size double is clever. There is stowage everywhere: under the forward berth, over the saloon sofa, in numerous galley lockers, and in the hanging locker and small sideboard in the aft cabin. That little red odds-and-ends tray set into the center of the folding table seems no more than a pointless quirk at first—it needs to be lifted out as the table is unfolded and then replaced—but it&apos;s beautifully made, fits perfectly, and after you&apos;ve used it a few times, you remember that it&apos;s things like this that give a boat character. But for all that, the real point to this interior is the obvious one: It has two cabins and two en suite heads. Few boats in this class can offer that much privacy and comfort in 39 feet, and while the aft cabin might lack full headroom, it&apos;s perfectly presentable for occasional guests or family visits—and of course, kids will love it. The new Atlantis has been carefully conceived with a particular market in mind: yours. It looks good, functions well, and handles beautifully. Can this "world boat" succeed in making its way in the world? That&apos;s entirely up to you.